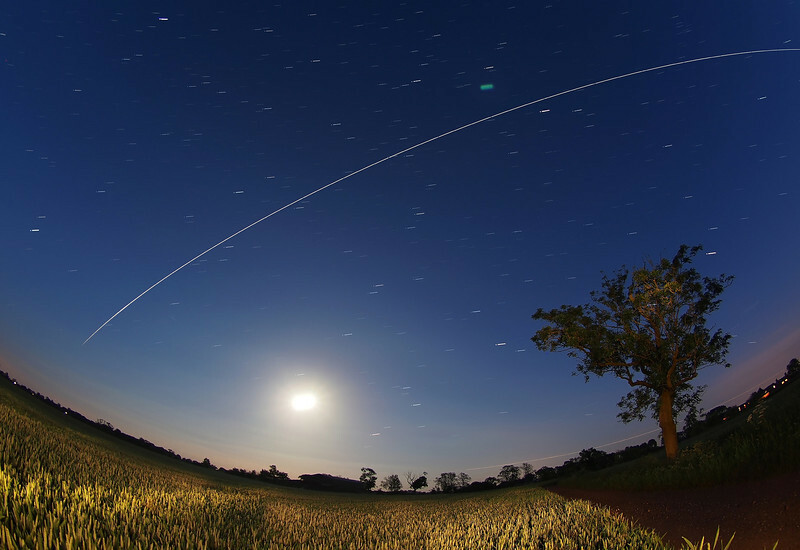 ISS flyby, 12 June 2014. The ISS delivers multiple flybys over UK skies during June allowing good opportunities to capture some or all, depending on cloud cover. This shot captures the 2259hrs pass. Especially dramatic as the flyby was a bit lower on the horizon and flew right over the moon fading out as the ISS enters Earth's shadow (love this). How did I capture this? Firstly, using my trusty GoSatWatch app I was able to predict the times and directions for all of the ISS passes (Well worthwhile download from the app store). I set my camera on a tripod pointing due south. Using a wide angle lens (8mm fisheye) I set camera in manual mode on a wide aperture (F4) and long exposure time of 15s and shot continuous exposures for the duration of the flyby (approx 15 No). When complete I hauled all the gear back indoors and downloaded. Using StarStax (Mac) software I imported each flyby exposure to generate a composite image. The long exposure time (15s) allowed the nearly full moon to shine out very bright. I lit the foreground with a large torch during exposure.